No, this blog isn’t about finding a man lost in a sea of similar-looking people, objects, places, or things. However, when your pet gets lost, it can be very much a similar experience for them! We all think our pets are unique family members and easily identified. That’s fine, as long as we can find where they are if they do get lost! That’s where a microchip can come in handy. 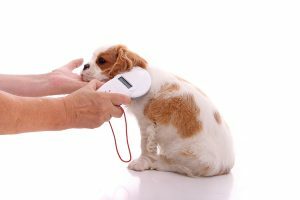 Are your pets microchipped? When I was in vet school, I volunteered during the Hurricane Katrina relief efforts. I worked at a secondary animal shelter taking care of displaced pets. It was astounding to me how many pets came through our shelter. It was always heartwarming to see owners reunited with their pets, but most often this only happened with microchipped pets. Those pets that weren’t microchipped, especially cats, were often sent elsewhere to be rehomed. It was also very surprising to me how many owners couldn’t definitively recognize their pets. Pets can get lost due to all sorts of reasons, let alone the obvious escaping through the front door or getting loose in the yard. Perhaps a visitor leaves a door open, or perhaps your window screen is broken and you didn’t realize it. Even worse, what if disaster strikes – flood, tornado, or fire. Wouldn’t you want to know where your furry family members went? Microchips for pets are an inexpensive form of identification for your pet (around $30 most places) that can be invaluable to getting your pet back to you, should your pet get lost. Pet microchips are small devices about the size of a grain of rice, generally injected over the shoulder blades. This is often done when a pet is spayed or neutered. However, microchipping can be done at any appointment visit. Microchips are “read” by scanners that show their microchip number. This number is then traced back to the company that made it, which matches up the microchip number with your contact information. This is a crucial point to make: The microchip number needs to be registered to you in order for someone reading the chip to be able to find you! So it is important to keep your contact information updated with your microchip company, so that you can be contacted should your lost pet be found by someone with a microchip scanner. August 15th is marked as AVMA and AAHA’s “Check the Chip” day. Please, make an appointment with us to have us check your pet’s microchip. Set a reminder to check your registration information. If you can’t remember the manufacturer of your pet’s microchip, as long as you know their number, you can look it up at: www.petmicrochiplookup.org. If your pet isn’t microchipped yet, please make an appointment with us to have that done! We want to help you find Waldo!